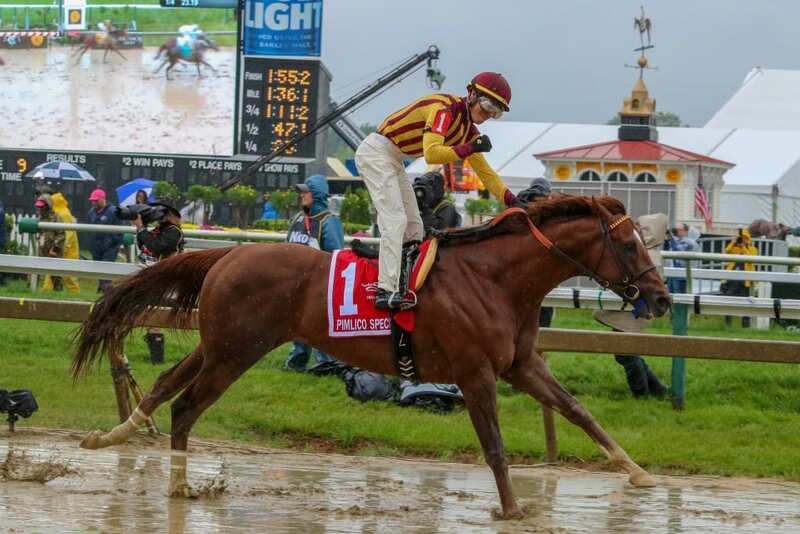 From the first call to the last, Irish War Cry (4-1) led every step of the way in the 48th running of the $300,000 Pimlico Special (G3) on a drizzly Black-Eyed Susan Day at Pimlico Race Course. It was the four-year-old son of Curlin’s fifth career victory, which pushed his earning over $1.2 million. Breaking from the rail on the sloppy surface, jockey Jose L. Ortiz aboard Irish War Cry got the early jump on One Liner (7-2), Afleet Willy (7-1) and the 5-2 post time favorite Something Awesome as they passed under the wire for the first time. Ortiz was ble to nurse the eventual winner through early fractions of 23.19 and 47.25, something of a surprise that he was able to dole out moderate fractions. Maintaining that lead at the head of the stretch, Irish War Cry responded to his pilot’s urging and steadily increased his advantage to the wire over his seven foes who were left to battle it out for the minor awards. The judges could not separate One Liner and Untrapped (8-1) for the runner-up spot, while Discreet Lover (20-1) rallied from the back of the pack to claim the fourth-place purse. Local hopefuls Afleet Willy and Something Awesome, third and first respectively in the Grade 2 Charles Town Classic last out, both appeared to have been feeling the after-affects of their grueling battle on April 21st, finishing sixth and eighth, respectively. Running time for the 1 3/16 miles was 1:55.51. Photo of Irish War Cry by Dottie Miller. “He a fast horse, he run some good races on the lead. I was able to see if they let me go easy enough. It looked like there was much pace on paper, but I guess they didn’t break as well as I did. He broke really well and that was a key. I went to the first turn and took hold of him and he relaxed well. When I asked him to go he gave me everything he had today. 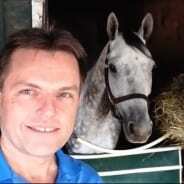 “He wasn’t running good at Gulfstream. I don’t know why. Today was more distance, too. He was working like a freight train in the morning and I was a little disappointed too, just like Graham. “I just wanted to get him back on track and I feel like today we did that. It was important to me. This horse shows so much in the morning and it’s so frustrating to see him run disappointedly in the afternoons. He really did get the thumps last time. I really think the hot, humid weather at Gulfstream doesn’t agree with him. He’s run his two poorest races down there. I think getting the cooler air of today is like running at Aqueduct last year. It’s just a different deal. It was very reassuring. Both Rated R Superstar and Something Awesome appeared to have trouble handling the sloppy Pimlico surface. The latter was unhurried early and eased late. The former raced wide the entire trip and passed tired horses in the final furlong.